All volunteers receive free entry into the Rock and Roll Hall of Fame, Great Lakes Science Center and USS COD. All volunteers will receive a Walk, Rock & Run volunteer t-shirt, food, refreshments and our appreciation. If you need volunteer hours contact Lorraine Pennick at 216-752-3000 or e-mail lpennick@diversitycenterneo.org. Volunteers should arrive NO LATER than 6:30 a.m. on Saturday, May 4, 2019 unless advised otherwise. PLEASE BE ON TIME! You will receive volunteer instructions on Friday, April 19, 2019. Check in for walk/run participants begins at 7:30 a.m.
3 hour commitment for that day. Volunteers will report at 6:30am, unless otherwise specified. Children younger than 15 can volunteer with an adult. 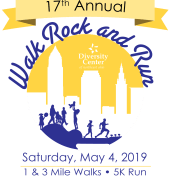 If you have any problems completing the volunteer form, please contact our office at 216-752-3000, or email lpennick@diversitycenterneo.org with questions.